"Any cereal can be used in this recipe." Grease a 9x13 inch pan with butter or cooking spray. In a large microwave safe bowl, combine butter and marshmallows. Microwave on high for 1 to 2 minutes, stirring every 30 seconds, until smooth. Remove from the oven and stir in the cereal. Press in to the prepared pan with the back of a buttered spoon. Let the treats cool for about 2 hours until set. Cut into squares and serve. I made these with Frosted Flakes Gold cereal and it just didn't taste right. I think it would have been much better with rice cereal. 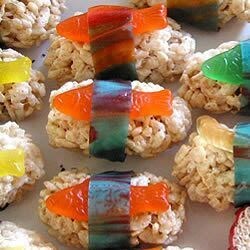 The gummi sushi idea was a big hit! I used less butter (about 4 Tbs.) and added 6 cups of rice cereal to make mine. Loved them! We used 4 kinds of cereal, including 1 cup of Cocoa Pebbles. We added a handful of Christmas M&M's----turned out yummy and colorful. My daughter said, "This was fun to make!"